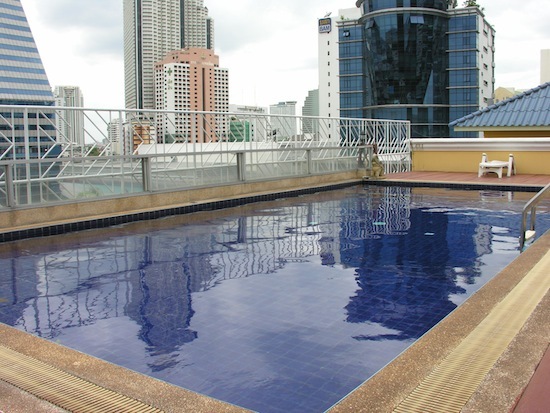 If you’ve got only around 1,000 baht to spend and are looking for a spacious air-con room next to a BTS station with a solid array of in-room amenities plus a swimming pool and fitness centre — well, your options are very limited. Yet King Royal Garden Inn offers all of that. It’s not the lap of luxury, but for the location, comfort and value, the King is worth considering. Average rating 7 from 2,943 reviews. The atmosphere is always buzzing here. Located on Sathorn Road in one of Bangkok’s priciest areas, King Royal’s location is ideal for exploring the city. Surasak BTS station is literally right in front of the hotel — you can be out the door of your room and onto the train platform in 30 seconds flat. The central Chao Phraya express boat pier is one stop to the west. Vibrant Silom Road may be reached by a 10-minute walk or one stop by skytrain. One more stop in that direction and you’re at the heart of Silom’s restaurant and nightlife scene, from where an MRT subway station and Lumpini Park are also a stone’s throw away. Even Siam Square is reachable by skytrain within 10 minutes from the doorstep of the hotel. 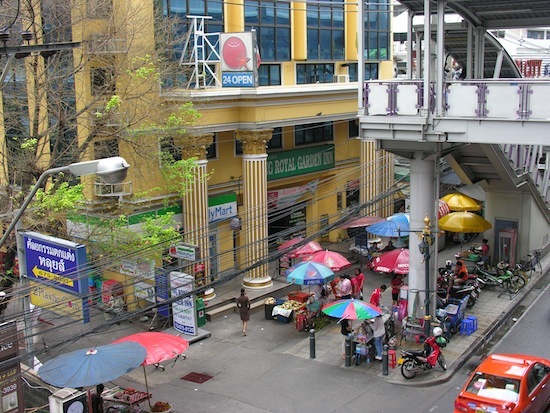 With the skytrain and an ever-waiting stream of motorbike taxis, tuk tuks and regular taxis always right there, you probably won’t feel the need to hang around King Royal’s immediate vicinity too much. For the sake of convenience, there is a 24-hour mini-mart out front and several street food vendors set up on the footpath from early morning to evening. One of Bangkok’s better fine dining Thai restaurants — Blue Elephant – is also right next door, and Baan Somtum serves authentic Isaan fare right around the corner. 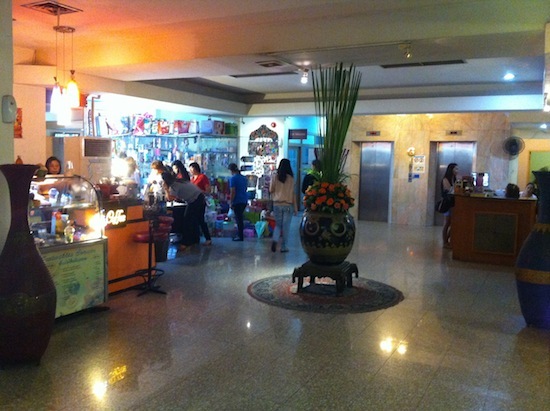 A florist, salon, health food restaurant, coffee stand, small shop selling this and that household necessity and makeshift clothing boutique each occupy a slice of King Royal’s first floor lobby area, which can feel like a micro-neighbourhood by itself. At midday the lobby and outside area bustles with chatting locals on lunch break. Although the area is very much accessible to tourists, one of the pleasures of staying here is being swept up in everyday Bangkok life every time you leave the room. We’ve found the staff to be consistently friendly and professional. Care to pick up a coffee or new wardrobe on the way to your room? While King Royal’s location is by far its biggest selling point, the rooms are adequate for the price/location: 900 baht for standards and 1,100 for slightly larger superiors. The nine-floor building screams 1980s and just about everything inside the rooms looks to be a good 10 to 20 years old. The worn carpeting lends a lived-in scent and we noticed some mould in the bathrooms, but rooms are cleaned daily and have been fine for us in the past. 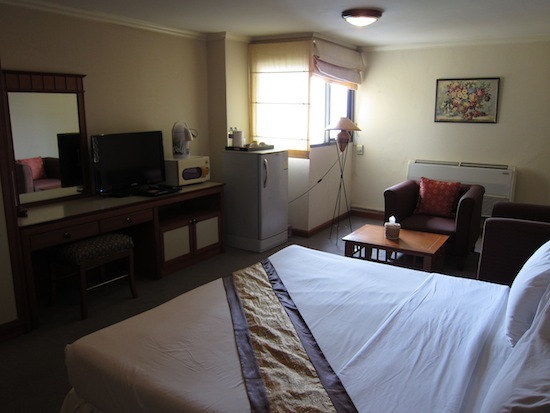 All come with firm but comfortable beds, TVs, large fridges, microwaves, safes, big bureaus, numerous tables, desks and free WiFi that works well in all but a few corners of the building. Bathrooms are rather dark and depressing but they do come with hot water and bathtubs. This is a superior, but the standards aren’t much different. A couple of drawbacks are the lack of balconies and only one small window in each room, but the hotel makes up for this with a pleasant roof-top pool and fitness area. Granted, not all of the fitness equipment works, the pool is tiny and the “hot tub” doesn’t heat up, but the common rooftop deck above the ninth floor is still a great spot for relaxing and watching the city rush by from above. Unlike the often crowded pool areas of more expensive hotels, there’s a good chance you’ll get the whole King Royal rooftop all to yourself. Not the best pool in Bangkok, but it will do after a hot day. Unlike some hotels that offer discounted rates on the web, King Royal actually inflates its prices if booking through its website, so it’s best to just walk in or book through online sites (see below), which generally offer rates identical to walk-ins. Rooms are also available by the month (10,000 baht for standard, 13,000 for superior, utilities not included), making King Royal a solid choice for a longer term stay as well.